Preserving tomorrow's hunting heritage today! 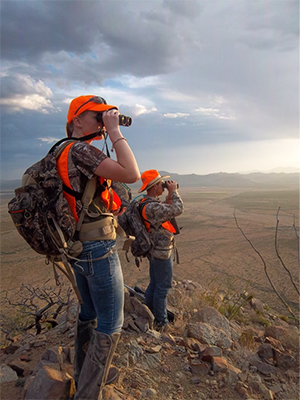 The Texas Wildlife Association and the Texas Parks and Wildlife Department have joined forces to offer the Texas Youth Hunting Program (TYHP). TYHP was established in 1996 to provide opportunities for youth to participate in hunting activities safely, legally, and ethically, while learning about the valuable role landowners and hunters play in wildlife conservation. We sponsor introductory, instructive hunts for deer, turkey, hogs, javelina, exotics, dove, small game, waterfowl, varmints and other species. Normally, we provide mentors, lodging and meals. TYHP offers more than 200 hunts each year, mostly on private properties to which owners donate access. We offer both firearm and archery hunts. Create a Youth Hunter Account at www.tyhp.org. Have a valid Texas hunting license and appropriate tags or stamps when required. Complete Hunter Education for Texas or another state. For information on course schedules and registration, call the Texas Parks and Wildlife Department at (800) 792-1112 or visit the TPWD Hunter Education page. You will leave TYHP hunts with experiences and memories to last a lifetime! Applying for hunts with the Texas Youth Hunting Program is easy! Login to your Youth Hunter Account. Review the Youth Hunt Schedule and click the "Apply" button for any hunts you are interested in attending. Note: First-time TYHP applicants get priority in selection! You must complete the application process, which includes providing a copy of your current Texas Hunting License and proof of Hunter Education certification to the TYHP Office. In addition you must submit other required documents such as a health history, liability release, etc. You will receive instructions for submitting the Hunt Fee ($150) to secure your spot. This fee covers you and your accompanying adult. Note that financial aid is available to help with the Hunt Fee. A parent or guardian is required to accompany you on the hunt. Lodging varies from tent-camping to indoor accommodations, and depends on facilities (if any) available on the host property. Loaner equipment (firearms, bows, optics, & some camping gear) is available - you need not spend a lot of money to try out hunting with TYHP! For additional information, please call: 800/460-5494 or visit www.tyhp.org.